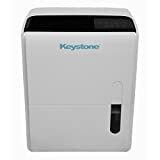 Keystone - 95 pint: Dehumidifier Review • The Air Geeks, reviews of air conditioners, dehumidifiers and air purifiers. In this buying guide, we will look at KeyStone 95-pint dehumidifier and explain some of its outstanding features. As you can see, it’s a huge appliance in terms of investments and we thought it would be better to know what it offers before going ahead to make a purchase. As one of the highest priced appliances online, this dehumidifier is meant to remove excess moisture from large indoor areas enabling them to be free of mold smells, allergens and other health problems caused by air that is not in optimal humid conditions. And with that, let’s jump straight into its features. When it comes to the size of the area covered, KeyStone 95-pint dehumidifier takes the prize here. At an astounding 6000 sq. Ft scope, this product promises to be what you are looking for if you have a large space. Whether it’s a warehouse, a large open-plan office or even the entire floor of a house, it will happily do all the work! There is, therefore, no need to purchase a dehumidifier for each room as you can use this single unit. This unit removes about 12 gallons (95 pints) of moisture from the air for every 24 hours. This is a very important feat to achieve for a dehumidifier as this means it is very efficient. It has a much bigger water tank so emptying it won’t be so often as compared to other dehumidifiers. One issue raised by many users is the inability of the water tank to empty completely especially when it’s using a hosepipe which can cause mold and scales to develop if not checked for a long time. One thing that this humidifier does extra with its hose drainage system is the inclusion of a pump. Many of the dehumidifiers currently on the market rely heavily on gravity to empty their water tanks. This sometimes poses a challenge as you’ll have to make sure the appliance is in a raised position in relation to the reservoir or the entry to the piping network. However, with an inclusion of a pump, you can happily place it even in the basement without needing to worry about purchasing another pump to move the water out. Handling this unit is also very easy with the omnidirectional caster wheels that make it easy to move the dehumidifier. This means you won’t have to lift it up or drag it on the floor if you want to change its position. It also has an automatic shut-off feature that turns the unit off if the tank is full or has been disassembled. This is very important for two things; First, this makes sure water does not overflow if the tanks are full as this might ruin floors especially those made of hardwood. The other important use of this feature is security. It prevents the appliance from running during electrical surges or when the appliance is disassembled which can cause burns and shocks. Let’s look now at the noise level. On this one, this unit passes with flying colors. This is because the noise of less than 48dB is considerably low for a dehumidifier. 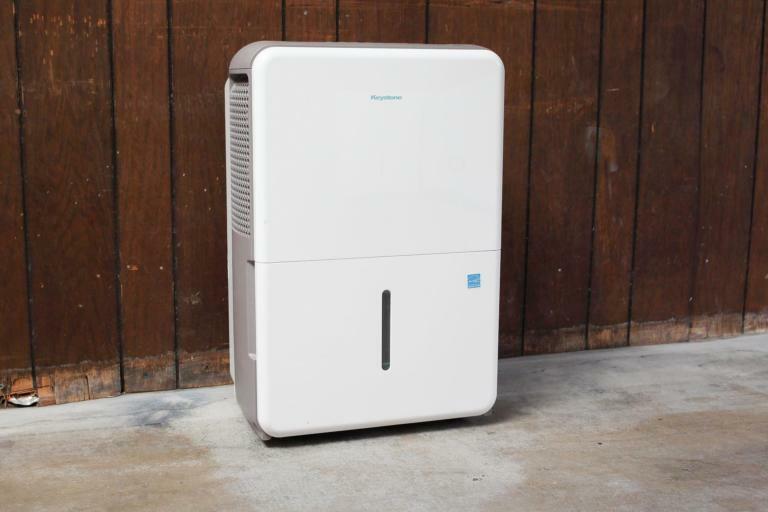 If you are looking to use a dehumidifier in the nursery or even in your bedroom, you have to look for quiet units and this one doesn’t disappoint. The sound emitted by the appliance is known as white noise as it is barely noticeable. It also comes with a washable filter included so you won’t have to replace it so often but wash it and place it back to its small slider shelf. KeyStone 95-pint dehumidifier also comes with an electronic digital display that includes a 24-hour timer. The controls are touch-sensitive and easy to use. You also get the liberty to choose your desired level of humidity anywhere between 35% to 85% percent. This appliance Energy star rated and therefore it won’t add too much to the electricity bill if you use it. It is quite expensive for a dehumidifier so you might want to be sure with it as it is a quite a massive investment. Also, the fact that the warranty only covers 1-year on parts and labor, plus an additional 4 years for the sealed system also need to be well understood. Great for Large Spaces: This dehumidifier is very useful for large spaces so you won't have purchase multiple units to cover each room. An Excellent brand: Keystone has been in this space for long and is a recognized player in the industry. Positives: Purchase this because the smaller unit was unable to do the job despite being advertised to handle more square feet then we had at our house. This one gets the job done Negatives: the directions are her Renda's Lee poor. I purchased a garden hose to go with us for drainage actually come to find out if you wanted on continual treated you have to use the pump future. The pump feature is another negative and that there will always be at least 40% of the water bucket full – it never gets near empty with the pump. I have not seen algae grow and we had it now for almost 3 months, and in our part of the country in the summer this thing has been running nonstop so the water must empty well enough weight to keep that from happening, but it's just not what I would prefer." It was easy to set up (07-28-2016). I needed it for my Church's basement game room. It brought down the humidity to 43% so far (was 54%). I didn't know that it had and ionizing feature to help get rid of odors. I routed the drain for the built-in condensate pump to the sump pump area. It is quiet on "turbo" (high fan)." So, now that you have all the information needed to take the next step, you can tell if this dehumidifier is what you have been looking for all this time. We still feel a lot can be done to justify the high pricing, especially when it comes to its lifespan and also the warranty. Other than that, this appliance is a good choice for your large space and with a pump included, means it works well in basements or in places where the drainage systems are raised. If you have time, you can as well check our other reviews before making your final decision.